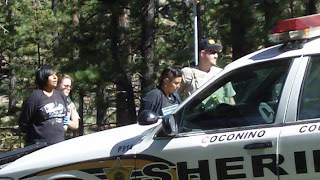 FLAGSTAFF, Ariz. -- Navajos and others defending sacred San Francisco Peaks said police used excessive force on those taking action to defend the Peaks from the use of sewage water for snowmaking on the mountain. Native American medicine men conduct ceremonies on the mountain, and gather herbs for healing ceremonies, on the Peaks, long sacred to 13 area American Indian Nations. "Those who cut us out endangered our well being ignoring the screams to stop. They treated our bodies the way they’re treating this holy mountain. If they had their way, we wouldn’t even exist. There is more danger in doing nothing. To idly stand by and allow this destruction and desecration is to allow cultural genocide," said one of the young woman who locked down. At sunrise on Thursday, June 16, 2011, more than a dozen people stopped ski area construction on the Holy San Francisco Peaks. Six individuals used various devices to lock themselves to heavy machinery and to each other inside the waste water pipeline trench, the six arrested said in a statement released Sunday, June 19. “What part of sacred don’t they understand? Through our actions today, we say enough! The destruction and desecration has to end!” said Marlena Teresa Garcia, 16, a young Diné woman and one of the six who chose to lock down. “The Holy San Francisco Peaks is home, tradition, culture, and a sanctuary to me, and all this is being desecrated by the Arizona Snowbowl Ski Resort. So now I, as a young Diné woman, stand by Dook’o’osliid’s side taking action to stop cultural genocide. I encourage all indigenous youth to stand against the desecration that is happening on the Holy San Francisco Peaks and all other sacred sites," said Garcia after being arrested and released. A banner was hung on the side of the trench that read “Defend the Sacred!” where two protesters were locked together. Over the half mile of open construction, the group chanted, “Protect Sacred Sites, Defend Human Rights!”, “No desecration for recreation!” “Stop the cultural genocide! Protect the Peaks!” and “Human health over corporate wealth." “This waste water pipeline will poison the environment and to children who may eat snow made from it. Snowbowl plans to spray millions of gallons of waste water snow, which is filled with cancer causing and other harmful contaminants, as well as clear-cut over 30,000 trees. The Peaks are a pristine and beautiful place, a fragile ecosystem, and home to rare and endangered species of plants and animals,” said Evan Hawbaker, one of the protesters who locked themselves to the excavator. “The U.S. Department of Agriculture, the U.S. Forest Service, the City of Flagstaff Mayor and Council, and the Arizona Department of Environmental Quality are all responsible for permitting Snowbowl to endanger public health, destroy the environment, and desecrate the Holy Peaks,” said Nadia del Callejo, one of the protesters who locked themselves in the trench. “Throughout history, acts of resistance and civil disobedience have been taken by young and old against injustices such as this. This action is not isolated but part of a. continued resistance to human rights violations, to colonialism, to corporate greed, and destruction of Mother Earth,” added Del Callejo. A separate group of supporters, some wearing hazmat suits, “quarantined” the entrance to Snowbowl Road. Banners were stretched across the road that read “Protect Sacred Sites” and “Danger! Health Hazard - Snowbowl." Shortly after initiating the action, a Snowbowl security guard spotted two people locked to an excavator. By 6:00 a.m. more than 15 armed agents, including the Coconino County Sheriff’s Department, City of Flagstaff Police, and the FBI stormed the mountain. At approximately 7:30 a.m., the Flagstaff Fire Department, assisted by County Sheriffs, started aggressively cutting two people from the excavator. “We took every possible measure to ensure our safety. Our actions were taken to safeguard Indigenous Peoples’ cultural survival, our community’s health and this sensitive mountain ecosystem. Those who cut us out endangered our well being ignoring the screams to stop. They treated our bodies the way they’re treating this holy mountain. If they had their way, we wouldn’t even exist. There is more danger in doing nothing. To idly stand by and allow this destruction and desecration is to allow cultural genocide," said one of the young woman who locked down. “The police's use of excessive force was in complete disregard for my safety. They pulled at my arms and forced my body and head further into the machine, all the while using heavy duty power saws within inches of my hand,” said Hawbaker. After being cut out, the two were treated by paramedics and arrested for trespassing. The police, firefighters, and paramedics then proceeded to cut two people locked in a nearby trench. Extraction took about forty minutes and the two were immediately seen by paramedics after being unlocked. One of the individuals sustained injuries to their arm from abusive force. Both were charged with trespassing, with an added charge of “contributing to the delinquency of a minor," for one of the individuals. Police proceeded to unlock the last group who was also inside the trench nearby. "Our only offense was resistance; resistance of the implications that's Snowbowl's development exudes. The police's defense was to implement tactics of fear to reach a goal, essentially to continue construction as soon as possible. Our safety was prioritized second to Snowbowl's demands. I was one of the demonstrators in the trench, locked at the neck with a partner. I was not aggressive. My lock was sawed through, inches away from both of our heads, secured solely and recklessly by the hands of a deputy. During the process, we were repeatedly asked to chant to reaffirm our consciousness. The police's response was hasty, taking about ten minutes in total--it was dehumanizing," said Haley Sherwood, one of the last protester to be cut out. Both women were also seen by paramedics. One was sent to the hospital for heat exhaustion although she denied feeling dehydrated. She started to faint during the extraction when police, EMTs, and firefighters attempted to force the pair to stand and move them from their location. Both women repeatedly expressed that they were being hurt and choked by law enforcement officers and firefighters. Both of the protesters were arrested for trespassing, with additional charges to one of them for “contributing to the delinquency of a minor” and “endangerment." Four of the protesters were taken to County Jail. The two young people were taken to Coconino County Juvenile Detention Center. FBI agents attempted to question four of those arrested. As word spread about the demonstration to protect the Peaks, overwhelming support and solidarity poured in from throughout the community and internationally. Bail was raised shortly after the arrests. All demonstrators were released by 3:30 p.m. Three of the protesters, including Marlena Teresa Garcia, immediately filed a report for excessive use of force after being released. This effort has my mental and spiritual support. Boooo hisss to the law enforcement officers who used excessive force. I wish I could be surprised at the abusive treatment but in fact, given what I have heard about Arizona , I feared it. I support the courageous protest . In solidarity with the struggle, from a Pilgrim's descendant in Phoenix...we know who the real trespassers are. Keep up the resistance! Protect the Peaks! Solidarity from anarchists in Ohio!